In the week since the players for the Spanish women’s national team released their open letter requesting the firing of manager Ignacio Quereda, more and more has come to light about just how officious and reprehensible his leadership has been over the entirety of his 27 years in charge. Querada has referred to his players as “chavalitas” (a word basically meaning immature little girls) or “niñas” (little girls); called them fat when he wasn’t happy with their fitness levels; refused to call up even the best players available to him if they got on his bad side; shouted at players literally to the point of tears; micromanaged every aspect of their time with the national team, including forbidding them from saying anything controversial to the media about Spain’s infamous machismo or criticizing the turf fields in Canada; and basically proved himself unable to treat his players with the most basic human decencies. The fact that this man—who only got the job thanks to his friendship with Ángel María Villar, the then-new and still-reigning president of the Spanish soccer federation—has been so inept at his managerial and interpersonal duties and yet has still kept hold of his position despite numerous attempts by players over the years to request change shows that this problem is by no means relegated to a single individual. As for the timing, Losada explained that the decision to go public was to ensure that everyone— from the RFEF leaders themselves to the fans and media back home watching—would know what was happening and that they would not stand for it any longer. With the eyes of Spain on them, they could finally reveal what was really going on. Vero Boquete during the Spain-Brazil WWC match. Photo by Getty. If we do it before the World Cup starts [the response] would be: “They are not focused on what they need to be.” If we had won, [our words] would have no weight because of course, if it all went well, how you could you complain? We are not talking about just this World Cup, we are talking about something that’s gone on for many years under the same conditions and there comes a time when enough is enough. We take our share of the blame because we have a sporting level to maintain, but there is another part that people do not see and that they should know is hampering us. Q. How are training sessions? Q. Is his methodology antiquated? A. Yes. There is no progress and it is very unprofessional. Some things can not happen: training is undemanding, repetitive and not very functional, he takes phone calls in the middle of training sessions, he gives instructions to only the 11 starters and treats the rest as if they were not on the team; it is disrespectful. His instructions are nonsense and screams ... An archaic structure, as if it were Spain 30 years ago. Ignacio Quereda on the bench during the Spain-Brazil WWC match. Photo by Getty. I’ve been in the national team for some time. I started when I was 16 and now I’m 30 and during that time I’ve seen a lot of things, players who have argued with him and were never called up again… but after so many years, at last, we’re united and that has given us strength. We’re not going to give up on this. 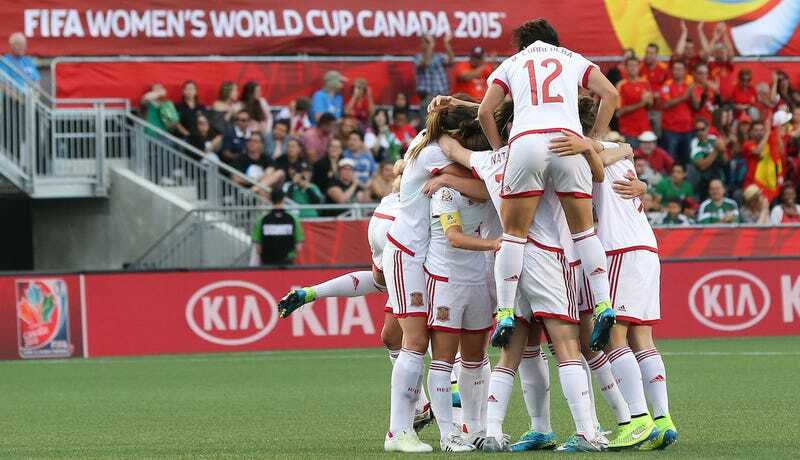 NE: Let’s talk a bit about the Spaniard Women’s National Team. You started in 39 caps and scored 40 goals while with them. What happened during that time? Del Rio: Yes, that’s correct. Being part of the team was a dream come true. Unfortunately things didn’t work out with Ignacio Quereda, the manager of the team. He’s been with the team for over 28 years. We don’t see eye to eye on many things. I’m not the only one who is no longer part of the team due to this. There are many. NE: Is there any way that you would go back? Del Rio: Yes, for Quereda to leave the team. What about that black legend that whoever says something the coach, Quereda, doesn’t like, she never comes back? There is the example of Laura del Rio, like other players who have disappeared from the national team. In my time it occurred also, with girls who the coach had conflict with because they said what they thought. There was also a formal complaint lodged by everyone and gradually he began to disappear people. Some things had gone very wrong because [the players] were more concerned that the manager not scream at them, that he not tell them they were fat ... it depended on how you approached him. It bothered them that he told them they were fat? You see, there were players who were a bit overweight, but there are many ways to say it. These things have to be said with some delicacy. We signed a complaint and delivered it to was the president of the women’s game, Teresa Andreu. I figured she would deliver to the Villar or whoever, but we never heard back. What happened is that Teresa then resigned. Make your own conclusions. María Teresa Andreu is one of the founders of women’s soccer in Spain. She played herself as a goalkeeper for Barcelona in the ’ 70s in a league unsanctioned by the Spanish federation, and was one of the leading voices of her time in the quest to form an official Spanish women’s national team. After about a decade of opposition, finally in 1980 the president of the RFEF created a subcommittee to investigate the topic of women’s soccer in Spain. Andreu was at the head of the committee. A year later, the group was able to establish a national tournament called the Copa Reina. By 1983, Spain finally played their first RFEF-sanctioned international match. Andreu stayed on as the president of the women’s team. Q. One of your first decisions was to appoint Ignacio Quereda as manager of the women’s team. A. I did not like Teodoro Nieto [the team’s first manager] and asked for a change. They wanted a coach from Madrid and the Coaches Committee presented us with three options. I was the one who chose and I appointed Ignacio Quereda. At first it was good because I was so involved, but eventually that changed radically. A. He eventually wanted control over everything. He is a person that will not accept a single piece of criticism and we collided often. I and many others. If we made ​​a list of all the players who have gone through the national team none would speak well of him. Even within the federation there are many people who have asked to change departments so as not to travel with him. The situation became so untenable that I had to tell him to stop attending meetings. Q. There are players who have publicly denounced insults and bad behavior. A. That I have lived firsthand. It is not something new. I have seen the mistreatment of players, how he screamed at them, how he ridiculed them, how he got on them about their weight ... I suffered a lot with them. I tried to check him on two occasions without success. If Villar had listened to me before we would not have reached this situation. The cancer of women’s football is named Ignacio Quereda. Q. You were there for the international mutiny in 1998. A. It was very similar to the current situation. The players drafted a letter and handed to him. I took charge of the situation and went to talk to Villar. He said he did not want any change, that the players could say Mass but he remained confident Quereda. Villar has always run away from the problems and wants people faithful to his side. “The players could say Mass.” The president of the Spanish soccer federation, upon being handed a letter outlining the behavior of the manager of the women’s team, detailing how he shouts at them and ridicules them because of their weight, responded by basically saying “they should pray on it because nothing will change.” And you wonder how it gets to this. And, believe it or not, that backwards mentality by those in charge of women’s soccer in Spain clouds their judgment in other ways, too. Just a couple days ago, the RFEF was sued by Seyer Gestión, a sports marketing agency the federation had contracted with in relation to the women’s game. The Spanish federation hired the firm in 2009 with the purpose of finding new ways to monetize and popularize women’s soccer. Seyer came up with various business plans and proposals over the years, the biggest one in 2013, when they brought the RFEF an offer of €6.6 million for six years by a company called CGP Sport, who would televise or live-stream every game, find field and kit sponsors, create a website and social media platforms, and perform many other services for the top Spanish women’s league. The suit itself alleges that the first real meeting about the offer took place between Seyer representatives, the RFEF’s secretary general, and Quereda. There, what the suit describes as “two startling events” took place. The first was that the representatives for Seyer were informed that the RFEF would have to consult with “María José Claramunt” before anything could be finalized. What happened next shed a little more light on why the RFEF started acting weird at that meeting. After that day, Seyer again sent the offer the secretary general of women’s soccer, as well as Quereda and Temprado, and later on even to Villar himself. For some strange reason, none of these men ever gave a definitive yes or no to the measure. Seyer repeatedly sent written and verbal requests for an answer over a matter of months, but never got a response. Finally, the deadline for acceptance passed and the deal was canceled. It’s because of that aborted deal that Seyer has now sued, alleging a breach of contract for not allowing the firm to perform the very duties they were hired to complete and (one assumes) any fees they would have made on that broadcasting deal. Ángel María Villar with Iker Casillas and Vicente Del Bosque in 2014. Photo by Getty. Instead, Villar is content with his buddy Quereda bossing over his charges for nearly three decades without producing anything in the way of national team success. And when Quereda does bungle his way into a winner—almost a statistical certainty considering the timespan we’re dealing with here—Villar still does nothing to support it. He didn’t attend the deciding home match against Scotland that would make or break their progression to the 2013 Euros, and no one knows if anyone from the federation was present in Canada. To really drive home just how little Spain cares about women’s soccer, Manuel Galan dug into the RFEF’s financials. What he found wasn’t pretty. For the budget as set in 2014, the RFEF had €126,235,000 to spend on soccer. Of that, €1,200,000 was spent on women. That’s just 0.95 percent of the federation’s annual budget spent on women’s soccer. Even those numbers don’t tell the whole story. Only about €800,000 of the €1.2 million came out of the RFEF’s own coffers. The rest came from FIFA, which mandates that federations spend at least 15 percent of the money FIFA gives them on the women’s game; the rest comes from UEFA. On top of that, the RFEF leaves even more money on the table in the form of state subsidies Spain has promised for entities that support women’s sports. Because the RFEF does not meet the requirement that 33 percent of the board be composed of women, they do not qualify for these subsidies. In contrast, Galan compared how much Spain spent on women’s soccer to how much other countries did. England spends about €15 million, France about €10.5 million, Germany €7 million—even tiny little Belarus, with €1.3 million, outspends Spain. And that doesn’t even take into account the number of licensed female players in the country, which Spain has over 40 times as many as Belarus. That’s not the only way Spain skimps on its female players. The club that won the women’s league this past season was paid €1,352.27 while the runner up earned €901.52, the same winnings as the champion and runner up of the 2002-03 edition. Since the ’90s, the women’s team’s per diem for every day spent with the national team has been set at €27 a day. This was only changed this year, when they increased it to €40. Spain’s international women basketball players receive a per diem of €300. It’s important to remember that underneath the open letters and the controversy and the financial figures are real people, women who want nothing more than to represent their country and maximize their potential in the game they love, without this parade of indignities. The most affecting of those stories to emerge has been an essay by Sandra Vilanova, one of Spain’s leaders during the recent era which culminated in the team’s second-ever Euro Championship in 2013. A staple in the side for a decade, she eventually served as captain during her run. Sandra Vilanova, challenging for a ball back in 2010 during a World Cup qualifier against England. Photo by Getty. Vilanova begins her story at the very beginning, with her first international call-up back in 97. It was a month-long training camp in Car de Sant Cugat between May and July. She was in high school at the time and so excited about the prospects of playing for her country that she skipped out on a number of tests to join the team and thus had to repeat those courses when she got back. You know what happens? You’re so excited, it’s the apex of women’s soccer, to compete at that level, one you’ve not experienced in the Spanish league. These matches, in stadiums, with natural grass, the whole protocol, such professionalism, and to push yourself to the max, because in those games you can really get everything, pure competition. You lose that ... fear. As much as football has improved in Spain, an international match is another level, and what a level! A few players, great ones, I have seen with tears in their eyes during workouts. For [Quereda’s] coaching, out-of-place comments, having little tact. I have seen friends in camps leave, because they were not willing to take it anymore. Call their parents and go home, goodbye national team. She then moves on to the most frustrating part of her international career, that 2013 Euro Championship that should’ve been her happiest moment. She says that “sometimes I feel that they stole ‘my’ Eurocopa from me.” She entered that tournament as team captain, and at 32 years old, she knew she was nearing the end of her career. Still, she was determined to enjoy the moment, a last reward of a huge international tournament after a decade of service to a horrible manager. In the back of her mind, she hoped that if she impressed at the Euros and if they secured the right results going forward, she just might make it on the World Cup roster in Canada. EXCUSE ME???? A transition period at the Euros? Are we crazy or what? To this day I still do not understand. You have to give way to the youth, yes, but do it during the qualification stage, that would be more consistent. Blessed consistency. After the Euros I hung up my boots. With what it takes to get there, all that we give up, more out of passion than anything else, with the efforts they make, that we make, that I made, that each and every international has made. It can’t be that they prepare for a World this way, that they play with our work, with our lives. I know that this reflection will close doors for me, I would have loved to have had the opportunity to manage the national team one day, when I was more prepared, more experienced. As you pursue a UEFA PRO LICENCE [a licence any potential manager must acquire before coaching top-level teams in Europe] you must aspire to the maximum, just like I did as a player and as I intended to as a coach. To train the best players in Spain, a sport that you know well because you have lived it, suffered for it. That which you will defend forever. A sport more for us than from them. But I prefer to support these 23 brave women who look elsewhere for personal gain. I am not like that, nor will I ever be. “A sport more for us than for them.” That’s about the clearest distillation of what’s at stake here as you could come up with, not just for the current Spanish players against Quereda and the RFEF, but for every future player in Spain and beyond. The fight for dignity of those 23 Spanish players is a fight for the dignity of the whole sport.